Fifa Online 3 will be coming to Korea by the end of 2012. Published by renowned online game publishers, Nexon, and developed by gaming giants EA the online football game has improved AI; better animation and dynamic 5 on 5 multiplayer. Touted as a next gen online game FIFA Online 3 should find a big following amongst the game crazy Koreans. Known for their predilection for videogames as sport, could we possible see Fifa 3 as the next Korean online supersport? Savannah Hahn of EA Korea believes that the partnership with Nexon will enable them to "deliver the highest quality services and game experiences". Naturally the new FIFA has a myriad of brilliant features and is said to be the best yet, now we can only wait and see how popular the world's favourite videogame sports franchise is in the East. If you're a Call of Thrones Fan and are having problems with your skills or just want to find out more about how to use your Call of Thrones' Skills then this guide is your must read. A Call of Thrones Character has 4 skill slots, some of which can be unlocked with gold purchases. How Do you get Skill Scrolls? Get skill scrolls by completing certain quests or buying  them from skill trainers. Skills can also be deleted at a later stage if you find that they're not a good fit for your character. Training is unlocked at level 15.This function can be used everywhere except on the world map and instance dungeons. Along with the skill points gained, it also recovers sp and yields a small gain in experience and combat mastery experience. Use this immediately if you  idle (while AFK, transferring items, making/embedding gems, checking out the player market etc.) for a while. Use it in areas where this state is activated because you'll have the risk of getting killed by other players at PK enabled maps. You could cancel this function by clicking stop/ train icon or moving your character. Roguhly you gain skill points every 35 seconds (ranges to 1-3 skill points for each skill tree) and at this time displays the amount of points/exp earned, but you could still gain a small portion of points and exp if you cancel it halfway. There's not much trick here. Mining ores, smelting items, harvesting and lumbering yields 1 point for every successful gathering. Auto-Quest (refer to the Battle method for more information) function is also available during the mining, harvesting and lumbering. Getting trade skills are also important since the raw materials sold by NPCs are pretty expensive and it is hard to find a good deal in the player market. For the weapon and supportive skills, points are accumulated for their respected skill tree they belong depending on the frequency of usage of skills during a battle. Skill points are rewarded after battle. Training at nearby dungeons of your preference, just be sure you switch from [Manual] mode to [Auto-combat]. It automatically continues to battle a new set of enemies every 10 seconds. 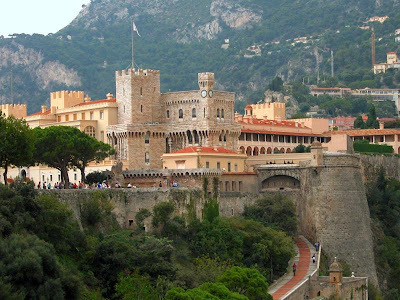 If you don't have much time in your hands, you could also utilize the [Auto Quest] function available for unlimited use for VIP members or you could exchange vouchers or gold for a fixed time. Unlike the VIP and gold options, in which you could train up to 48 hours (2 days), you could only train for a maximum of 12 hours and you could also get PK by other players if you are using the voucher option. To avoid this from happening, to find a dungeon where your character will be out of sight at players spawn points. The fun part of using the auto-quest function is that you could still train for skill points even if your offline though it is much slower. For this method you should pack up on EP recovery and EP drain equipment, this will be useful with your automated grinding and this will also eliminate the need for using EP recovery items that also wastes a turn for your character. EP drain are more effective using skills that gives out multiple hits, so  Dual-Wielders are best suited for this job. For other weapon types you might Just as well try to increase your EP Drain stat. The easiest way to acquire EP recovery and EP drain attribute is by embedding Gems to your equipment. Having a Healing items, skill and stat (HP Drain, HP Recovery, HP Healing) are also vital to sustain yourself from damage you'll receive throughout this ordain. Get a healing skill as early as possible since healing items costs you  coins, hogs up your inventory, not as effective as the heal skill and you might  also run out of healing items during your offline long hour auto combat  sessions. Note: This method is also a great way to level up your Pets, Mounts and Relics at higher levels. If you want to level up your supportive skills quickly, just select the [Supportive] auto-combat preset. Your character will now prioritize the use of supportive skills like healing and buffs, it even uses heal skill even if you didn't receive a substantial amount of damage. Poison however is more like an offensive skill even though you could purchase it from the supportive skill trainer. Cell Shaded graphics are usually a good thing. This holds true for Princess Punt, an Action Puzzle type of RPG. Although the word "punt" really reminds me of American Football, this game doesn't really have much to do with the sport. The main character is a princess who kicks off her bombs and men/bodyguard/protectors into the battlefield. On levels with bosses, you get to kick a variety of men; an archer, a lancer, a magician/sorcerer, and a knight. Once you kick a character into the field, you no longer control them. Each round you kick in another character. Tap on the bomb or ball(in this case the fighter that is going to be kicked) to cycle and select your type of ball/ammo/attack. Kicks are performed like catapulting or shooting an Angry Bird. Unlike that game, however, your minions that you kick out stay on the field and attack each round unless their HP is brought down to zero or they fall off. Enemies attack you at the end of each round. Each type of weapon has different attacks and skills and different Mid-Air Attacks. Mid Air-Attacks are activated by a tap on the screen while your non-bomb shot is in flight. The path of your previous kick will be shown with a dotted line that is placed during flight. Bosses randomly pop out upon level selection. 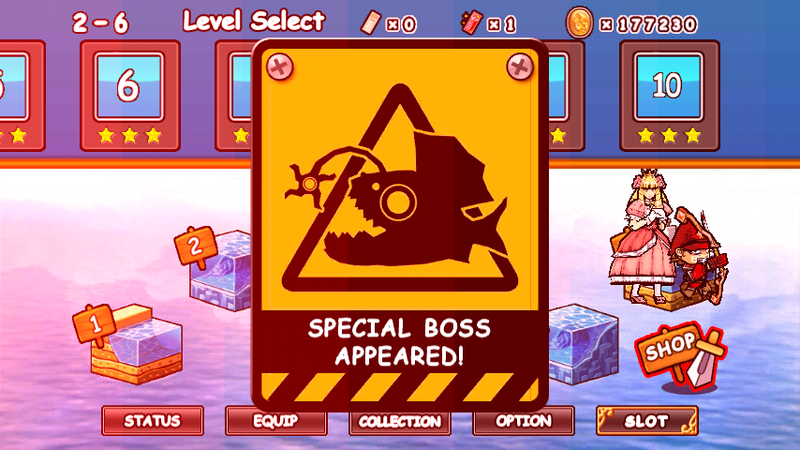 On stages without bosses, you can only equip your main hero, referred to in the game as "Hero". You may equip different health items, attack weapons, and skills. Only one skill, one health or defense item, and one skill may be equipped at any given time. The skill must be the same type as the weapon. If a skill for a different weapon is chosen, then usually the strongest corresponding weapon will automatically be equipped too. The only things you may purchase at the Shop are Skills. Once a skill it bought it is usually automatically equipped. During gameplay, tap the ammo to change shot type. Tip: If you are already aiming the kick and decide you want to change the type of shot, then you can press pause(upper right) and then resume like you were not aiming yet. Hint Alert: Pressing "Retry" is not the same thing as "Continue". Continue will use large amounts of your gold to refresh your men and amount of kicks left, but keep the damage done to the enemy. Retry is restarting the level all over, meaning you lose your progress from that stage but it's free. It will still load that stage again though. When you gain the maximum experience for an item, that item is considered "Mastered." Each time you master a health item and skill, your attack and maximum health increases. Each time you master a weapon, your attack increases. Once a skill is mastered, it's next level will be available in the store. Bosses drop a lot more experience whenever you hit their weakpoints. The weak spots are revealed to you at the start of the fight. However, they seem to drop more attack experience than other kinds. This was problematic when I only needed skill experience points. Bosses are big and detailed. The animations and attacks are smooth. Some weapons and skill combinations are better in different situations. Although I haven't exactly figured out the main use of some of all of them. Some weapons will be easier to use than others. You may come back to lower levels after you get stronger. Equipping lower level items that aren't Mastered the second time around will help you Master those items because you will be stronger already. Actually you probably have to come back anyways because if you just keep pushing new levels, then eventually you'll reach levels that you can't beat because you haven't mastered enough items. While on the world map or stage selection, you may enter the shop or equipment area. While browsing through acquired items, the attack, and change/difference in attack to your attack item will be displayed on top. The same will happen for health/defense items but for health stats instead of attack stats. Next to the EXP in the middle will be a fraction displaying your current amount of experience for that item on top of the amount of experience with that item that is required to Master it. A nice touch is the addition of being able to rotate your Hero in the Equip area. Upon completing a level, your princess does a celebration dance and your hero joins her and you receive bonus's for each kick that you had left unused. Then you will be taken to a results page. Here you will choose what kinds of experiences you want. There are three kinds of experiences. All of them count towards your characters level. The three kinds are for your Weapon represented by an icon with a Sword, Health Item represented by a Pink Crystal icon, and Skill with a Lightning icon. All experiences cost gold to use. I am not sure but I believe ratings are based on number of turns you take, the number of your men who were knocked out, and the amount of on screen coins (Princess Coins?) collected during the fight. Mid-Air attacks should be taken into account when trying to collect these coins. For example an Knight pops up a little then flies straight down after you tap when he is in mid-air, while an archer pops up a little then flies almost straight down, a lancer jumps up diagonally towards the right, and a magician does a backflip and then flies horizontally forward a ways. Princess Punt scores really high here. The Cell Shaded graphics are really impressive. The details reminds me of Okami. The storyline is kinda lacking....or maybe I just don't get it. Since this is an application, storyline isn't a standard or expected. The cutscenes at the 1st level of every stage (map?) are detailed drawn manga's or comics. The details of the drawing sure surpass a whole lot of apps out there, although it doesn't tell much of a story. Although Princess Punt has been classified as an Action Puzzle type of RPG, I try to stay away from using the term RPG if it isn't a traditional Japanese Role Playing Game or have a big and long storyline. Each map has 6 areas. And each area has 10 levels. The 10 levels are the same as each other (same enemies in the same spots in the same background) but with slightly stronger versions of enemies. The Sounds are neat from the menu clicks to the attacks. The friendly music, to the kicks and monster Roars sometimes reminds me of a Mario atmosphere(the princess too) and that's a good thing. From my experience Mario games have lots of quality. Helpful gameplay hints are displayed during loading screens. Although the English isn't perfect, it's understandable. Princess Punt is Xperia Play Optimized. The optimization wouldn't be really helpful if the game didn't have response issues during the slot/ticket selection. It seems to have problems moving left and right sometimes for choosing the slots. The R and L shoulder buttons come in handy here because they let you cycle through the slots selections. There is a Princess Punt THD that is exclusively for Tegra devices. It adds shadows, more lighting, and weather effects without sacrificing framerates. Both versions have a 4.6 rating on Google Play with a combined total of over 1 Million downloads(mostly the non HD one). Try it out. If it isn't your type of game, you should still be able to appreciate the artwork. How much data do you need for your Smartphone? With people increasingly relying on their mobile to connect to the internet how big do you need your dataplan to be? Popular online uses for Smartphones are checking emails;downloading Youtube videos;online shopping and more. Indeed most activities that users traditionally conducted on their laptop or Pc are increasingly being done via their Smartphones. This could be costly if you dont have the right data package. British mobile carrier Tmobile offers an unlimited data plan; their recent statistics show that Smartphone users data usage is on the rise. A year ago their unlimited data plan users used just over 400mb on a monthly basis. Just a year on and that figure has rocketed to 1.1 Gb of data on average. As Europe's slow mobile networks catch up to the rest of the world and 4g networks become the standard and video and game streaming picks up even more;then your data plan needs to grow. If you come across All you can use data plans then it might be a good idea to get them. A very real example of this is that this article was written on an Android Smartphone and published via 3G whilst on a coach journey! 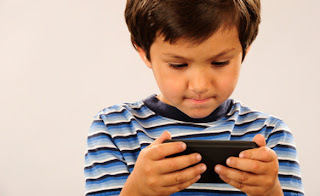 Stop Kids getting Paid Apps on iPad. There's a ten to 15 minute window after you enter your iTunes ID and Password that another One click download can occur without you entering your password again. In that 15 minute purchase window either watch the child carefully or restart the iPad. Get another iTunes ID for your child, but don't associate a credit card with it. iDevices can have more then one user ID associated with them so your child can use their own one to happily browse the thousands of kid friendly apps and games out there. Lastly just use the security options on the iPad. There are built in password locks that can stop certain apps and functions being activated without a passcode put in, just activate the security feature under settings to save yourself a fortune in Itunes bills and having hundreds of embarrassing inexplicable apps on your iPad. 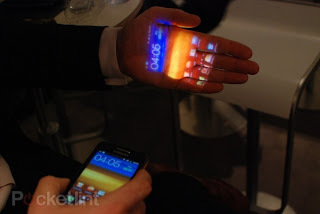 Samsung have been working at an unbelievable pace to prepare the Android update for the Galaxy S3 smartphone. Sources say that the Samsung Galaxy S3 might be getting the Jellybean update as soon as August. This is an extremely fast pace for a phones update to be rolled out; the majority of handsets expectancy for previous Android updates has been measured in periods of many months. In an equally unprecedented move Samsungs last year flagship phone the Galaxy S3 will also be receiving the Jellybean update. Read between the lines and if you are a S3 owner realise that you have w remarkable and powerful handset;that if Android updates can be so quickly shoehorned in proves that the phone has a lot of future proofing built in. We just love the fact that there are so many good free apps out there, but is the fact that many good quality apps are ad supported a double edged sword? In fact fully aware of how services like Openfeint can really enhance an app, I'm shamefully one of the first to press the "No thanks I don't like fun button" . Not because I don't believe in Openfeint , but because my phone's wi-fi and data connection is often turned off to avoid the hazards of pop up advertising-does Gun Bros really deserve a pop-up ad for craft supplies at MisterArt.com ? However as a financing model pop up ads irritating as they are can serve a purpose. Glu Mobile uses this model to great effect in Samurais VS Zombies Defense with Glu credits being rewarded by clicking on ads. Other games are also coming up with the reward model of " click on this ad once per game session to disable ads" which works for me too. Now if they can only make ads less obtrusive and more catered to the type of game I might start to turn on the Wi-Fi more often and Openfeint needn't keep telling me I'm boring! Following on from the recent info about Maple Story being released onto Android it seems that the publishers are setting their sites on the mobile gaming market. Their latest game MonkeyOoky Jigsaw puzzle is now free for iPad. 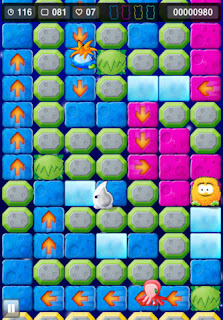 In the well made puzzle game images from Nexons well known games can be puzzled out. With the obvious boost to their profile apparent by making their well known games into a puzzle; it also makes us wonder what Nexon has next in store for iTunes. Spending a lot of time on the internet as you do when you're researching the latest apps and games I sometimes come across websites and services totally unrelated to the Smartphone World but that are desperately crying out to have an app made about them. Strangely enough the marketing conceit of online gifts hasn't really gained much representation with Smartphone apps, neither Android nor iOS. When you think about it a Smartphone would be the ideal medium for choosing an Online gift: High def photos; easy to use touch screen interfaces; all of these things just point out the need for a gift service like hostess gifts to take that plunge , realise that 65 percent of net commerce goes through mobile phones nowadays and make an app for online gift services that really works before someone beats them to the punch. Tower Worlds is a Facebook game recently out of beta... but it could have stood a lot more testing. As it currently is, it'll just bog down your internet connection for nothing. The tutorial is a slow, laborious slog. You have to trudge through every animation of your character moving around, and they are sure dragging their feet. I don't know if it's because of the 3D graphics, the coding, or as part of the design, but everything takes a lot of time to happen and then to be acknowledge by the game. No chance of popping in just for a quick session. 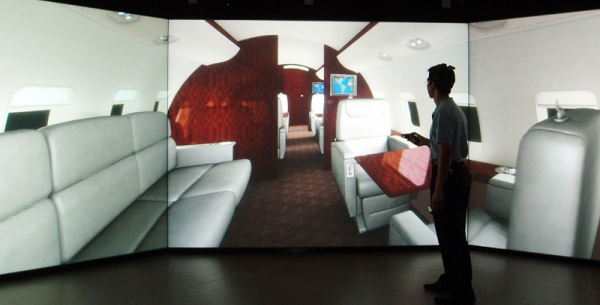 These 3D graphics are supposed to feel realistic, but are badly pixelized and bland – in game, because the promotional material as zero relation to the finished product. Beyond that, the general aesthetics is horrid, lacking some unifying theme: palm trees and wooden watch tower, but Western-style house with red roof tiling? And of course, this whole visual disaster only slow down the game to the point of almost-complete unplayability. The music uses a little flute tune which is pleasant enough, but again, lacking a strong aesthetic direction. The game is touted by its developer as a mix of tower defense, RTS, and RPG: I haven't really see any of that, just the usual Facebook fare of quests, resource collection, and building upgrade. Yes, there is a combat system, but I find it boring: just clicked on the “bears” (they look more like foxes or wolves to me...) to hack at them and click the combat button when you're tired of seeing the same animations over and over again. In conclusion, I find it an unimaginative game copying the same old mechanics, ideas, and more of hundred of other Facebook games, but with enough ambition to trip itself and fall flat – in extra-slow motion. 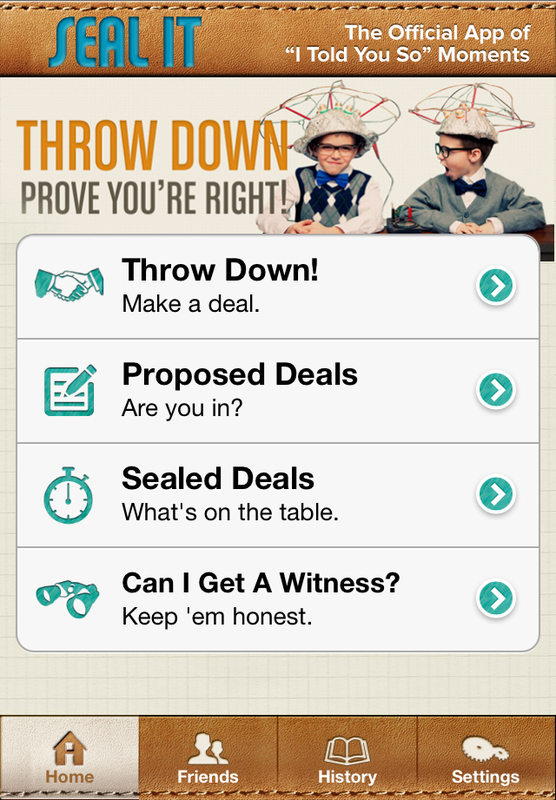 A phrase we often use is : "There's an app for that!" So we're just doing a little comment driven survey to find out what you think are the most obscure and useful (or useless depending on your perspective) apps out there. Like many of our articles inspiration has to come from somewhere and that was when we were researching this article and found that one of the most popular non game apps on Google Play at the moment is the "How to Tie a tie " App. Now if that is really trending for Android we wondered what other marvels we could find , we'd love to see an app for cleaning leather furniture for example. That's what HE said-all it does is say that phrase, over and over and over again! Scary Kitty: You pat the cute little Kitty, then a scary face scares you. Awesome if you need an app for scaring kids! 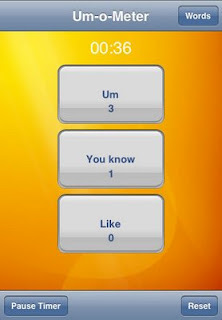 Three irritating words are Um; You Know and Like, and guess what the Um-o-Meter lets you tot up how many times your less than eloquent friend uses each word. Pretty Useless! What useful or useless apps can you come up with? Skweek is a recently-launched app for iOS, as a revival and update on the old Skweek of 1989. Visually, it indeed harkens back to that era: vivid, almost-neon hues, small sprites with simple forms and color-swapped versions, a good ol' concept of "walk on the tiles to paint them". Even the chiptune-inspired music could be playing on an old Atari. However, nostalgia isn't enough to make it work for me. The tutorial is both too slow and too short. Despite the overabundance of speech bubbles, there is no explanation on the different tiles, power-ups, or enemies. The tutorial lacks closure to make you feel like you've accomplished something and are ready for tougher challenges. You can redo the tutorial later, but what's the point? A simple screen or two with the description, in list form, of the aforementioned different tiles, power-ups, or enemies would have been far more efficient. I also have issues with the control scheme, my little "skweek" lurching around and slowing down without any discernible reason. Furthermore, the concept of the game just bored me in one minute flat : you only have to wander around while avoiding or killing slow-moving enemies; the one difficult is not falling down holes, but because of the control issue, my character just kept joyfully diving headfirst of the ledge. And I tested Skweek at home; I can't just imagine playing on the go. To be fair, the title screen (rightfully) reminded me of "vintage" brain-teasers and I expected an "you can only walk on on each tile, unless it's a special tile" kind of mental exercise. I jumped to conclusions and was immediately proven wrong, which may partly explained my lack of enthusiasm. It relies on skill, avoiding enemies and walking carefully, which is not my preferred kind of game, especially on Iphone - and especially when the controls impede whatever skill you might have. Last but not least, it's completely free, so you can always download it and check for yourself. Recently we ran an article on iPad artists, particularly looking at the work of David Hockney, one of the most famous iPad artists of modern times. 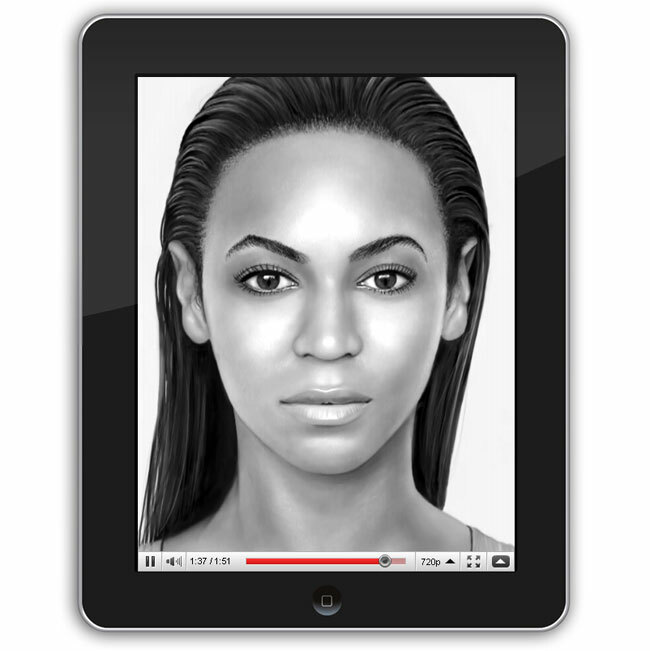 Admittedly audiovisually and in the realms of fine arts the iPad has been somewhat of a seachange. But more can be done in the way that we view and perceive these visual artefacts. premier mounts to display and admire our pictures, TV's etc will always have a place, but surely with the prevalence of cheap screens and iPad streaming abilities we should be moving away from these ideas to less cluttered spaces that don't have a plethora of mounted pictures on every wall and "dumb" televisions. The abundance of digital photo frames and digital cameras on the market should have spelled the end of framed photos. They haven't. Cable TV-surely iCloud will eventually see this off-it hasn't yet. Steps in the right direction are the aforementioned iPad streaming capabilities which should make every screen in the home equal ; the Samsung Galaxy Beam SmartPhone with its Pico projector is now out too-this too should open up new possibilities. Until we all embrace the new possibilites of media in every room though we will still be admiring art like David Hockney's in physical spaces; rather than in the way Steve Jobs intended us to. 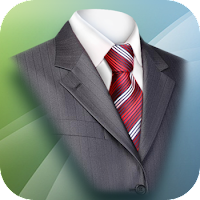 If you're an Android owner and a man of business then you're heading in the right direction. Android phones have really changed the way we do business. Business cards, note taking, scheduling, research, and even low end PA functions can easily be handled by Android phones. Of course the iOS devices can also handle these but I feel that they are hampered by virtual reliance on iTunes. As an example I have friends who are event designers and this is how they would use their Android Phone to sort out their next function. A Google search on the phone to find suppliers and venues, a trip to the venue using Google Maps. Pictures for comparison taken using their phone's camera, a good measuring tool app to get the venues dimensions. If they were to see another potential customer then business cards could be shared electronically, Standard note taking about a customer's requirements is easily handled by ICS ability to take voice notes or a premier business app like Evernote can easily take and upload notes to the cloud. And moving a step forward especially for business like functions that involve the physical changes of one area to another (event organising ; architectural changes etc) Virtual reality layering through time and physical means is also coming on in leaps and bounds. And that's why the use of Android phones has changed the face of business as we know it. Unotelly-Netflix without Regional Lock? Yes, please! We're still at the preliminary testing stages of a new Video streaming service that does away with Geographical limitations and allows you to watch TV Globally. Neyflix; Hulu and more are meant to be a universal, convenient and entertaining medium that shouldn't be effected by where you are in the world. Unfortunately that isn't the case so lucky for us new kid on the block UNOTELLY is doing something to change that with a DNS based system that allows you to watch online TV on a vast array of electronic devices. 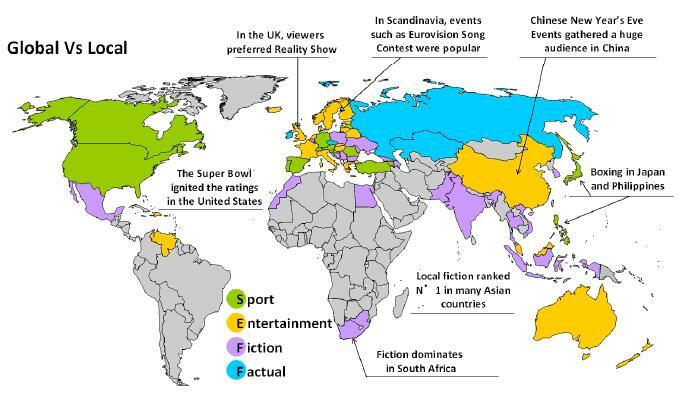 Another exciting feature for gamers (and we know that the majority of our readers are) is that regional locked content can be accessed from any country. For example with PSN network support us in Europe are often left with handicapped game versions due to different censorship laws or even PS3 releases that only come out months later due to the need for multilingual translation. Well say goodbye to those old PSN restrictions thanks to Unotelly. We're only in the preliminary stages of testing at the moment due to our huge review schedule but have checked out the chanells available (impressed!) and set up the account (which took all of 3 minutes and was a very simple process). As we get more in depth with the testing we'll let you know about all the other features and how good Unotelly actually is, here's hoping it lives up to it's promises. Which Mobile Phone has a better Graphics Chip? Ever since I made my mark as a app game blogger I've wanted a phone up to the job of whatever modern smartphone gaming could throw at it. So playing on some industry contacts , some forum advice and some other sources we're going to take a quick look at what Graphic Chips are hot in mobile phones today. 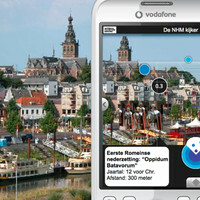 The Mobile world is moving at a great deal faster pace then traditional computing. Just a year ago I was quite impressed by the graphics capability of my Xperia Play ( Qualcomm's 1GHZ Snapdragon Process combined with an embedded Adreno 205 GPU was benchmarked to handle 60 FPS and all Xperia optimised games) Sadly even on release the phone was underpowered and the graphics chip could not handle DirectX very well , or at all. Just over a year later and the premier Android handsets are the Samsung Galaxy S3 and the HTC One X, both with the SnapDragon Qualcomm Processor and Adreno 225 GPU. Until game devs start churning out Gears of War for Android we're still left with the likes of the superb Shadowgun as an everyman's benchamrk test for mobile graphics. The Samsung S3 doesn't bat an eyelid. The Antutu benchmark test is often used to test a devices capabilities; it test Memory; Graphics and the Speed of a devices CPU: the Galaxy S3 scores over 12 thousand beating devices like the Asus Transformer Prime-which being a tablet should really be able to squeeze more processing power into it's guts. A more graphics orientated test is the GL Benchmark Standard Egypt Test which is a measure of a devices ability to handle high end 3D graphics. An incredible score of 59 , only matched by the new iPad was earned by the Galaxy S3. As of 6 August 2012 ARM has announced the latest GPU's for mobile devices and Smart TVs. The Mali T600 Series comes in 3 variants and will supposedly deliver 50 percent performance improvement over previous mobile GPUs. Words like "console class graphics for mobile" have been bandied about . The need to address fragmentation is a concern of the new Mali T 600 chips with less need for multiple codecs and different colour textures and standards supported. It's amazing how much our technology has transformed the way that we wear fashion. Aside from the matching purses and iPhone skins that are a woman's staple de rigeur fashion even more fashion decisions are informed by our need to keep our modern smartphones close and protected. Just a few years ago Manbags were unheard of for the average Joe Bloggs. Now with the need to carry Ipad's ; Nintendo DS's; PS Vita's and a Smartphone of Choice (notice Laptops are off the list as simply nobody bothers with that old tech any more) a manbag for your gadgets is more than acceptable. And when you think about it even simple clothing choices, such as the need to have deep and secure pockets to keep your phone in are part of our day to day choices. The Samsung Galaxy S3 has quickly gained a reputation for having one of the longest lasting Smartphones batteries currently on the market. So with this in mind I was willing to experiment a bit more with my Android phone's functions. Previously with the Xperia Play that I was using, battery life was quite run of the mill; so to save on the juice I, as many other Android users would do, turn off all unnecessary features when leaving the house. That means Wi-Fi off; backlight to low and GPS to off. GPS being one of the biggest battery wasters on phones. However with the 2100 mAh battery in the S3 I wanted to just leave everything on and go off and experiment. I especially loved Google Maps feature of tracking your location history and then giving you a graph of how long you spent at work, at home etc. Great; nifty gadget and just a modern wonder that doesn't really do much, but being an owner of a premier gadget phone I'm all up for a bit of fun. Does Location History on Google Maps work though? Well in one week I travelled 3000 miles and visited carpet cleaners chapel hill nc three times (despite not leaving England and not going more than a few miles in a day)! Google Maps Location History FAIL! Barry Steakfries you have a new rival and he's not even human. 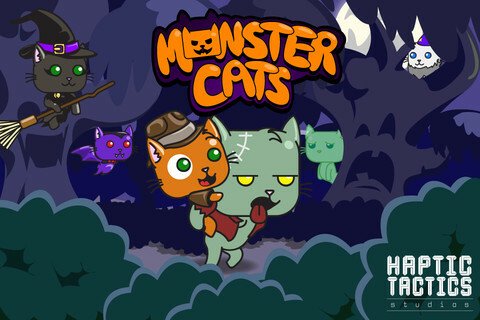 Monster Cats is more than a homage to Jetpack Joyride though and expands upon the endless running genre in a remarkable way. The fact that Monster Cats (available for Iphone and iPad) comes from a small indie studio is remarkable as the game brings a lot of spit ; polish and addictiveness . Let's face it top examples of endless runners like Jetpack Joyride quickly seep their way into our game playing addictions, but less well done games are a dime a dozen and often the staple of starting out app game programmers. 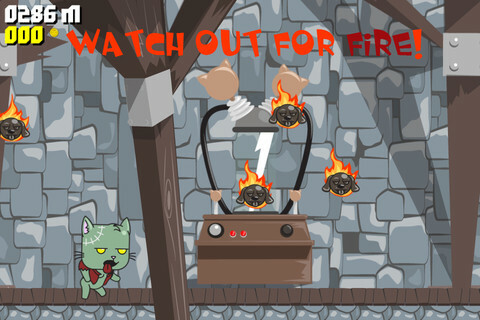 Details, details,details Gentleman and Mittens and his other incarnations certainly have them: Awakening from his cat lair complete with much Kitty shaped furniture (don't worry it's not too cutesy the graphics are pitched just right) Mittens sets out on his endless run (Question to Haptic Tactics Studio: When the app deservedly gets more downloads and some more cash comes in will you add a back story? This will really complete the game). The main avatar of the game has a lot of character sleuthily dressed in a cross between a Victorian gentleman and a feline Indiana Jones; his mismatched eyes lend a degree of manicness to Mittens that other games would simply embody as cuteness for the sake of it. 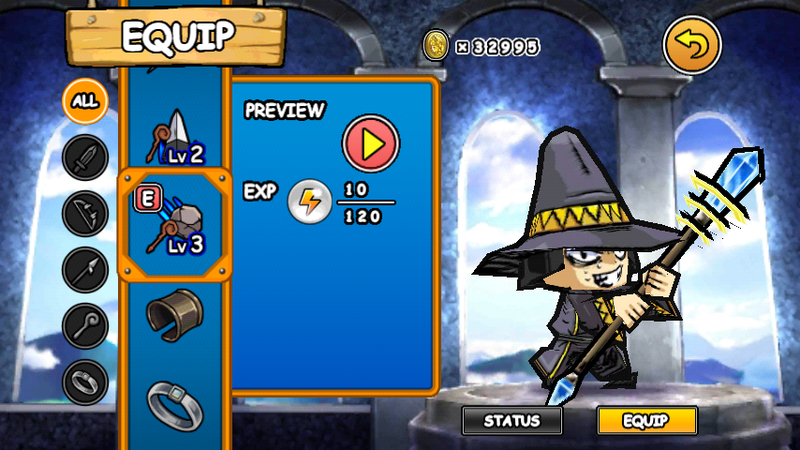 As you progress more of his alter egos are unlocked: Fangs the Bat Cat; Mystic the Wizard and six others (these are unlocked by earning in game points and with money earned in game). Now this is where I truly stood gob smacked that the little Indie Studio who could squeezed so much love into the game-each alter ego has their own backdrop that they run against. 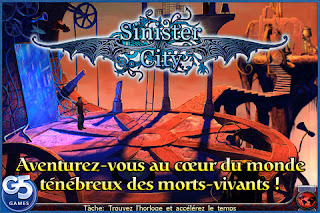 Fangs has a scary Dracula type castle for example, so not only is our gamer's curiousity aroused by seeing which character which will be unlocked next but what crazy locale we'll find ourselves in. The aforementioned other King of Endless runners has the famous gadgets update (See Gametrender's very popular guide to Jetpack Joyride Gadgets ) but Monster Cats comes straight out of the box with a system of badges that imbue different properties . So for example you might have a badge that lets you swing from the forest roof or change gravity. Very nice touch there. Undoubtedly comparisons can only be drawn with Halfbrick's masterpiece; but our only criticism for this indie inspired addition to the genre is that the enemies are too familiar in their behaviours to Barry Steakfries foes. Other than that a brilliant addition to the endless running genre which comes heaped with character; longevity and playability ( and yes achievement mongers those are there too along with missions to make you have that one more go feeling) . 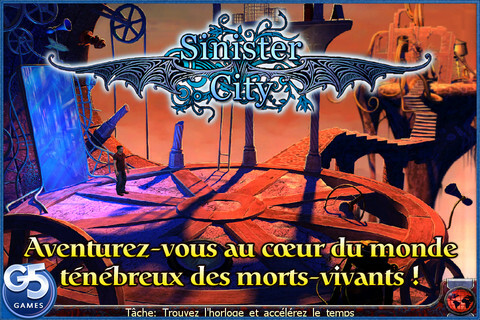 Haptic Tactic Studio your iOS adventure game was straight into the top 100 of US Adventure games on just after Monster Cats was released; now we know why! If you're a Samsung Galaxy S3 owner then you need no introduction to S Voice. Whether the Samsung powered voice search will become redundant as more Jelly Bean Updates role out is a matter for some debate. One wonders why there isn't some sort of Voice Search Collaboration going on between Google , whose Android software now powers most Samsung phones and the Korean Electronics giant. They're the master of hardware solutions so why not pool R and D funds etc. with Google to come up with more expansive soultions. With a swift broadband S voice isn't bad; particularly when it comes to Internet searches. The most obscure phrase we could come up with cubital tunnel splint actually returned the results of more than a few local businesses that provide this product. Searching with Siri on the other hand continuously produced the results " We can only search for businesses in the USA." Very poor considering Siri's supposed Global reach. If you looking for a wordsearch app, then here is an app for you, Wordruggle. Play against all other players currently connected. Each match lasts 120 seconds or two minutes. Unlike most online apps, this app doesn't use Feint to connect. Both times that I tested this app, 60+ players were on. And yes I have placed top 12 a few times (placed 3rd twice). Wordruggle currently lets you see how many times you've had the best score and how many times you've played (in a Today section and a This Month section). The menu is simple and easy to use, just like the app itself. Click on the light bulb for a slight hint list of how many _ lettered words there are. Click on the Snake looking button to rotate the letters clockwise. This doesn't scramble the words so the the list of possible words don't change, just your orientation of the letters.One unique feature of the WordRuggle is that is tells you the definition of some of the words if you want to know after the match. There are lots of words during a game so the words don't stand out as much as in a hangman game, but it's still nice to have the option nevertheless. If you try to start a match while one is already in progress, you'll have to wait for them to get done first. The wait isn't long. The games sound and graphics are decent and user friendly. A warning sound will be played when time is running low. After a match or game, you will have to wait until the server finishes up the score within 15 seconds. A list of top scores will be displayed and your name will be in an orange bar to remind you. I'm still currently a guest. Your screenname or nickname can be easily changed in the main menu. A suggestion I have is for the app to keep track of how many times I've placed and the places I were in. If the game gets really popular, more groups/servers might be needed. This might even allow for players to have less waiting time (although not necessary yet). One problem I encountered was that the same group of letters were used in two back to back games. I wasn't paying attention to the list of words after the first round but some people were. I noticed the scores were a lot higher the second time around. After a game, the next high scores lists automatically starts, and then the match automatically begins. Although this keeps the game at a faster pace, adding a "Stay on this page" button would be nice and useful especially for looking at the words and their definitions. Maybe a "Ready for next match" be used if the Stay button is activated. Wordruggle is brought to you by the developer(s) at AGA Studios. Download the new app from Google Play here. So far the numbers are growing so if you want to win, you should start now before this app gets a whole lot bigger and competitive. Make use of your smartphone. Have fun while expanding your vocabulary. 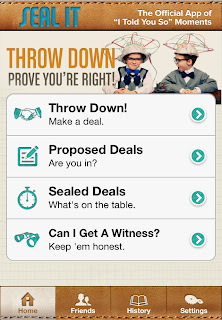 A few weeks ago I mentioned in my Contract Killer App Review that I played this app back and forth with that game. Both Contract Killer and Big Time Gangsta require you to come collect your earnings every hour our so to quickly gain money. The title of the app gives away the maturity level of this game. It contains no cursing and no hand to hand combat. If you don't have a problem with Grand Theft Auto type of games then this app shouldn't be a problem for you. In fact, if you like those games, BT Gangsta should be on your to get list for your smartphone. It's violence and language is toned down (a Plus). Reminiscent of Mafia Wars. Yep, Lady Gangstas are included in this app. Purchase and equip new weapons. Hire new goons. This game is FREE to Download. A ghetto type of application with this much detail is impressive. There are no headshots in this game. In fact I don't think there are critical or vital shots neither. 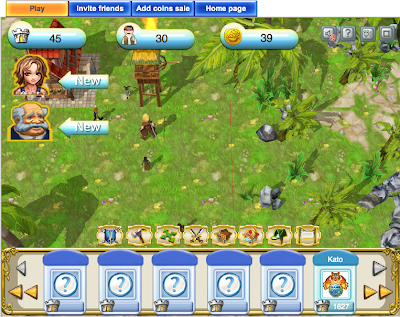 Battles or Fights are carried out like in a simplified Civilization strategy game. Only 3 Gangstas or units from each team are allowed on a battlefield at a time. When a gangsta's healthbar is reduced to 0, that gangsta will be replaced by a gangsta from the bench or team if there are any. Be sure to equip items that can be used inside battles like health packets and increased bonuses. After each non arena battle, if a gangsta has some HP remaining, then he or she will fully recover. If a gangsta's hp is taken down to 0, then that gangsta will be out of order until that person recovers. Take over or make hospitals your territory to heal 10% faster. While at least one of your men are recovering, you might as well send some of the others that are left to do individual missions. Another good reason to do missions is when you know you aren't going to play the app for a while. This will make your men use your time wisely. Some weapons are Dual Wield Weapons, meaning that a gangsta may equip two of those at one time(two of these weapons must be bought separately). The number of the currently equipped items are in a red circle on the bottom right of the equipment icon. Each person may carry up to two different in-game items besides your weapon(s). 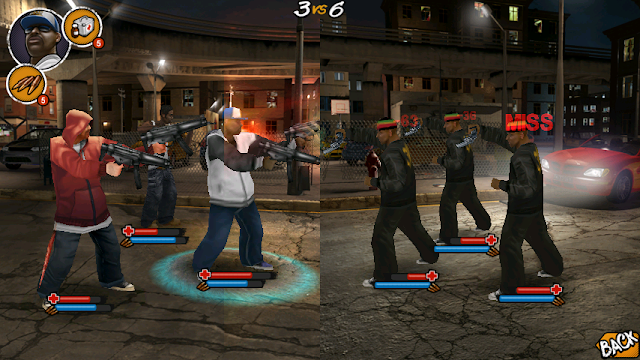 To use an item during battle, click on the gangsta and their equipments will be displayed on the top left of the screen. Click on the item to activate it. A sound effect and some visuals will signify the use of the items. Different items have different sounds. Upon usage, the item's icon will turn gray and be unable to use until the waiting period or cooldown is over. 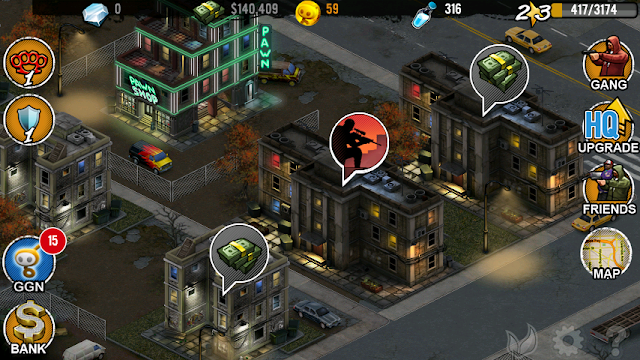 Win battles at a building location and make that part of your territory. It sort of runs like a corporation game where you expand your business to collect greater amounts of profits. Real money doesn't have to be spent on this game for it to last long, just patience and persistence. Constant checking in to collect your territories to collect money and get experience each time. This app is by far the best I've seen for allowing you to get real money credit or Glu Credit in game. Upon leveling up, you receive 3 Glu Credits. You don't have to use those cred to progress to make the game last a long time. By signing on everyday, you get a bonus slot spin that could earn you money or even more Glu Credits. Facebook is required to get the daily free slot spin and money bonus. Activate the Facebook feature located in the semi transparent settings icon on the world map. A little Pinch and zoom feature available on the world map(and only on the world map). Even some of the cars on the street drive around, including police cars and their flashing lights. The icons on buildings move up and down a little bit to give them a little more life. 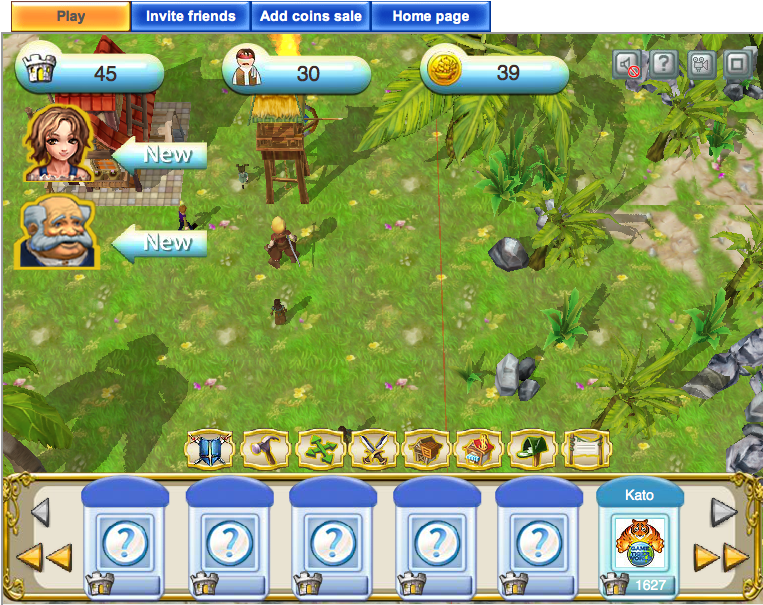 Tap on money icons to collect it and gain a small amount of experience. 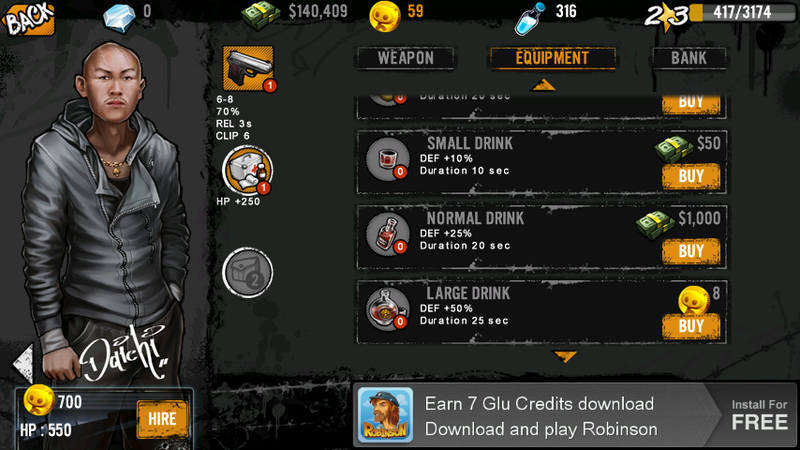 In late game you may get a visit from a Contract Killer, another Glu Mobile game called"Contract Killer". A nice touch. I haven't experienced cameos in apps. The Arena is where you test out your team against waves of enemies. Unlike normal battles, your gangsta's don't heal after each battle. Before and after a fight, you are given the option to Walk Away, Purchase and Equip items, or participate in the next wave. Your progress in the Arena is displayed on the right and looks like something from Who Wants to Be a Millionaire. "Cash Out" ='s take what you've earned and leave the Arena (tournament). 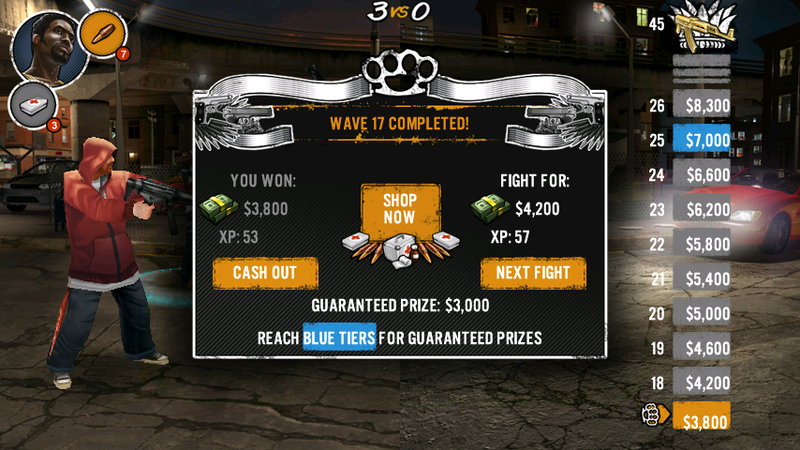 You are only guaranteed money when you lose after defeating a Blue Tier or wave. Two types of weapons are recommended because the same types of weapons usually run out of ammo about the same time. I don't recommend the Arena for gaining money AND/OR experience unless you stop at a wave where are starting to be forced to use Medium level healing kits. The later waves are strong and require you to use a lot of expensive items, defeating the purpose of fighting them to win prize money. Just waiting for your men to collect money on the world map is a lot more time efficient. For example, I only got 20,000 from beating the second to the last wave(last wave has no reward money, just the weapon and some experience). -If enemies are strong, then I try to click on each person and activate an attack boost right as the match is starting(try during the beginning animation before shots are fired). I Rarely use anything other than healing kits though. -Click on a character to control their shots. Basically will shoot shoot faster than if automated. Your gangsta will shoot whenever possible at the target you are clicking on. -Try to run out of ammo with one character and force him to reload as you go control another of your characters. This will make it less likely that you come back to a character with only a shot or two left, then be forced to wait as all your characters reload and possibly take damage. -Right after the battle is done, your characters will do a finishing animation pose. During this time you may still use items. (If you do use items during this time, remember that the cooldown/waiting period to use those items again for that person will not instantly refresh unless you click on "shop" and come back to the Arena Menu(where you can click "Next Fight"). -If you aren't fully recovered at the end of this battle, you can still recover during the starting animation of the next fight. -My few experiences with having the "The Pump (shotgun) + 20% Spread" were worst than the unlocked earlier "Menace MP5 + Dual Wield". Had the pump on one of my three starters. -So far I've only tried and used the Small Damage Boost and the Small Med and their Medium counter parts. This may not be the best strategy but so far it's been working for me. Just got my first golden gun(the Gold Hammer) by beating the first Arena. After my guys heal I will try to beat the first Arena again to equip a golden weapon on more of my men. A gangsta game without a crib wouldn't be very complete. That's one thing that Glu Mobile didn't forget when designing this game. Upgrade Headquarters(HQ) with lots of options and you will receive diamonds. Diamonds are used for working out your characters which will extend their maximum health. Blue Water Bottles are used for sending units to do special missions (the ones for single units). You will have a surplus of these bottles with not much use for having so many. I wish Glu Mobile would fix this as this is probably the only thing bugging me about the game. Another minor oddity with the game is the SHOP. Items are cheaper than their listed price. I suspect this was modified or updated to make the games more playable. However, the store forgets this before the purchase and players must have at least the posted amount to make the purchase. This isn't as player unfriendly as one might think. Think of the pricing as a level or rank requirement to own such a weapon. Right now I do not know if the men become stronger or gain any benefits besides unlocking weapons with the user level or not. The in-game music is good, not too gangsta, and definitely not annoying. Load times are short, a few seconds. The nice screenshop on top isn't. 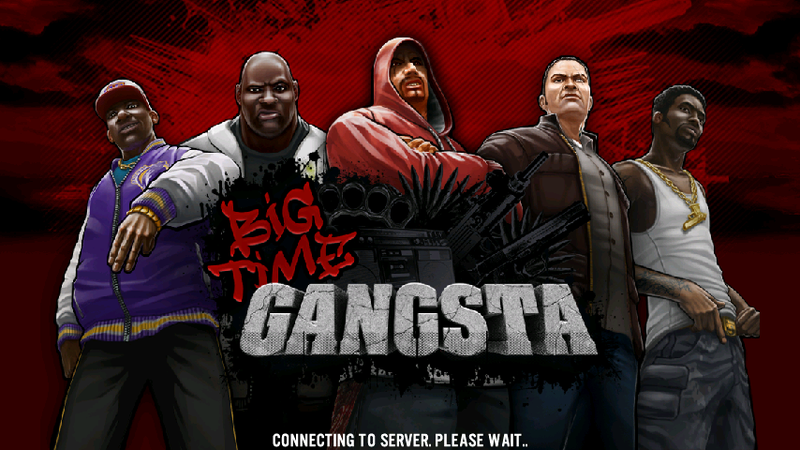 Once again, Big Time Gangsta is brought to you by Glu Mobile. A lot of the big games by developers such as Glu Mobile and Gameloft are made for both iOS and Android OS. Download BTG from your respective app store and see how you like it. I suggest playing this with Contract Killer (if you haven't tried CK) to help you kill more time and decrease your waiting period to collect if you really have that much time on your hands. Since there is a lot to cover on this app, I might update this article if I think of other things that belong here.